1. H.264 video up to 720p, 30 frames per second, Main Profile level 3.1 with AAC-LC audio up to 160 Kbps per channel, 48kHz, stereo audio in .m4v, .mp4, and .mov file formats. 2. MPEG-4 video, up to 2.5 Mbps, 640 by 480 pixels, 30 frames per second, Simple Profile with AAC-LC audio up to 160 Kbps, 48kHz, stereo audio in .m4v, .mp4, and .mov file formats. Be that as it may, Apple TV may still throw you into an awkward situation in case you want to watch DVD movies on Apple TV with your dearest family since built-in DVD player is not available on this widescreen TV. 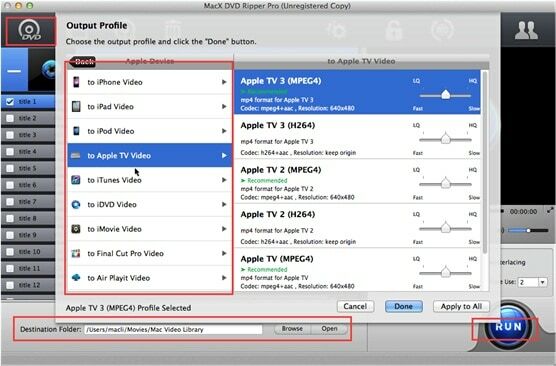 What you need to do is to rip DVD to a format recognized by Apple TV. Here MacX DVD Ripper Pro can do you a favor and help you digitize DVD to MP4, MOV, M4V, etc fast on Mac (macOS 10.12 Sierra included) or Windows (10). With a few clicks, you can turn your Apple TV into a real DVD movie library without spending a single cent! While converting DVD, you don't even have to worry about DVD copy protections as this Mac DVD converter enables you to remove all kinds of DVD protection technology, no matter the CSS encrypted DVDs or Sony ARccOS protected DVDs. MacX DVD Ripper Pro can 1:1 rip DVD movies to Apple TV 4/3/2/1 and other Apple iPhone iPad iTunes QuickTime in H.264, MPEG-4 and more without annoyances of any copy protections, 36x faster speed and original quality. Step 1: Load DVD Movie You Want to rip by Clicking "DVD Disc"
Download and run this DVD ripper for Apple TV, you can get the Mac version or Windows version based on your need. Then click "DVD Disc" button to import the DVD movie on your Mac. Select the output format as you want. You can choose " to Apple TV" as your output format. In addition, you can also rip DVD to iPhone 6S/6S Plus/6/6 Plus, iPad Pro/mini 4/Air 2, other hot Android devices and more. Click the " RUN" button to start DVD conversion. After the process is over, you can eventually play DVD movies on Apple TV without format trouble any more. In addition, this DVD ripping software also performs fast DVD to music ripping on Mac, so that you can listen your favorite audio on your MP3 player. You can also rip DVD to more output formats, or make 1:1 DVD copy to a single MPEG2 files with original audio and video quality. Best DVD TV ripper - MacX DVD Ripper Pro enables users to freely rip commercial & homemade DVDs to iTunes, Apple TV, iPhone, iPad and other Apple readableformats MP4, MOV, M4V with high quality reserved.